← Fluoride debate: Response to Paul’s 6th article. 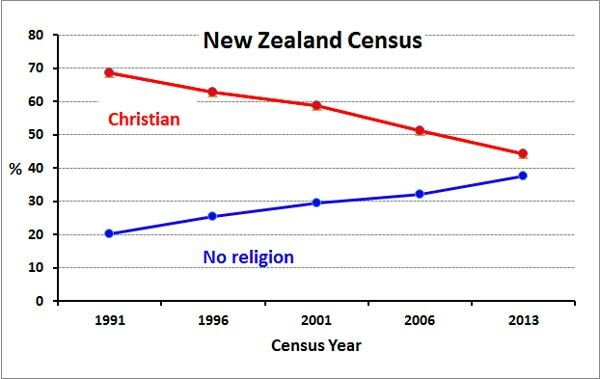 Statistics New Zealand has released preliminary figures for religious affiliation from the 2013 census. It is interesting to compare the last census figures with those for the previous four. As we can see, the godless trend has continued unabated. One thing for sure – Christians can no longer claim to make up the majority of the country’s population. *Double Dipping arises from people putting down more than one answer to the question. Eg – “Born again” and “Assembly of God.” It most probably occurs for the Christian, rather than No religious group. If this is the case we should adjust the Christian total to 1,879,671 – 101,733 = 1,777,938. This would cut Christians as a proportion of the total population to 41.9%. The No religion is accordingly 37.7%. The other major religions have Hindu – 2.1%, Buddhist – 1.4% and Islam – 1.1%. For more detail see 2013 Census where tables of data can be downloaded. This entry was posted in agnostic, agnosticism, atheism, Christianity, New Zealand, religion, SciBlogs and tagged census, Christian, New Zealand, no religion, religion, SciBlogs, Statistics New Zealand. Bookmark the permalink. Today sees a post at Why Evolution is True which will be news to most New Zealanders. Apparently blasphemy is an imprisonable offence in NZ. If this is on our books it certainly hasn’t been prosecuted in my lifetime. It would be laughed out of court. (1) Every one is liable to imprisonment for a term not exceeding 1 year who publishes any blasphemous libel. (2) Whether any particular published matter is or is not a blasphemous libel is a question of fact. (3) It is not an offence against this section to express in good faith and in decent language, or to attempt to establish by arguments used in good faith and conveyed in decent language, any opinion whatever on any religious subject. (4) No one shall be prosecuted for an offence against this section without the leave of the Attorney-General, who before giving leave may make such inquiries as he thinks fit. Interesting….OK if unless you use indecent language!! I think that is patent nonsense.